Manila, Philippines - The Philippine Atmospheric, Geophysical and Astronomical Services Administration (PAGASA) on Sunday, July 6, 2014 has released public weather forecast for Typhoon Florita with international name of Neoguri. Typhoon Florita, the sixth tropical cyclone to affect the country this 2014 has entered the Philippine Area of Responsibility (PAR). At 6:00 am today, the eye of Typhoon "FLORITA" was located based on all available data at 1,150 km East of Tuguegarao city with maximum sustained winds of 165 kph and gustiness of up to 200 kph. It is forecast to move west northwest at 24 kph. 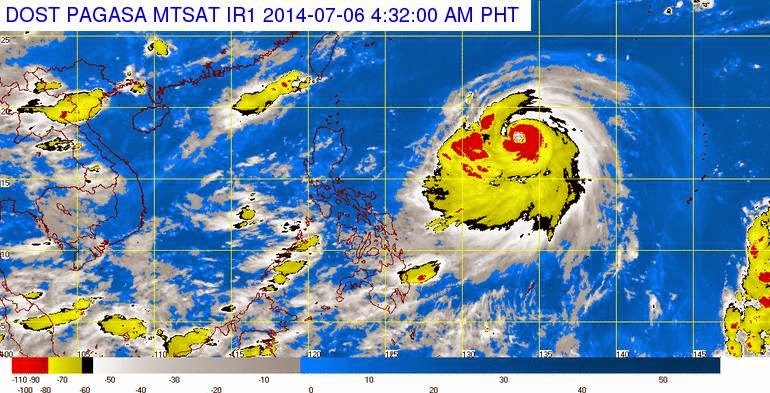 Pagasa weather forecaster Connie Dadivas said Florita is expected to be out of PAR by Tuesday. It will head toward Taiwan as it moves northward. The weather bureau said that Bicol region, MIMAROPA, Caraga, Northern Mindanao and Visayas will experience cloudy skies with light to moderate rains and thunderstorms. For Sunday forecast, Metro Manila and the rest of Luzon will have cloudy skies with occasional rains. The rest of the country will be partly cloudy to cloudy with isolated rainshowers or thunderstorms. Moderate to strong winds coming from the southwest will prevail over Southern Luzon, Visayas and Mindanao and the coastal waters along these areas will be moderate to rough. Light to moderate winds blowing from the southwest will prevail over the rest of the country with slight to moderate seas.